Eye-tracking technology is seen as a key to detecting persistent scanning errors. Eye-tracking technology, used along with simulator training, could identify problems with pilots’ instrument scans and help them correct their techniques for future flights, experts in aviation training and the use of eye tracking say. For example, if a session with eye-tracking technology shows that the pilot monitoring is looking outside when he or she should be monitoring instruments, “you’ve identified a problem,” Capt. Mark Cameron of Emirates said during a presentation to Flight Safety Foundation’s International Air Safety Summit, held in November in Seattle. Co-presenter Patrick Nolan, general manager for aviation with eye-tracking equipment manufacturer Seeing Machines, added that the goal is not only to determine what a pilot is looking at but also to put that information into context. For example, Nolan said, eye-tracking equipment can help determine whether a pilot is checking the airspeed before calling for flap extension. An instructor who is armed with that information, Cameron added, can help pilots improve. They cited three accidents — the Aug. 23, 2013, crash of a CHC Scotia Eurocopter AS332 L2 Super Puma during approach to Sumburgh Airport in the U.K. (ASW, 6/16); the July 6, 2013, crash of an Asiana Airlines Boeing 777 just short of the landing runway at San Francisco International Airport (ASW, 10/14); and the March 24, 2008, crash of a Spanair McDonnell Douglas DC-9 on takeoff from Madrid-Barajas Airport (ASW, 12/11-1/12; see “Identifiable Patterns”). “Wouldn’t you like to know what those pilots were scanning” during the critical moments immediately preceding each of those accidents, Cameron asked. “We can guarantee that all … of these events happened [during simulator training] first,” and that, if eye-tracking technology had been used in the simulator, it would have identified the pilot’s eye movement patterns and enabled the pilot to adjust those patterns for a more productive instrument scan. AAIB. Aircraft Accident Report AAR1/2016, “Report on the Accident to Eurocopter AS332 Super Puma, G-WNSB, on Approach to Sumburgh Airport in the Shetland Islands, 23 August 2013.” Published March 15, 2016. NTSB. NTSB/AAR-14/01, “Descent Below Visual Glidepath and Impact With Seawall; Asiana Airlines Flight 214, Boeing 777-200ER, HL7742; San Francisco, California; July 6, 2013.” Adopted June 24, 2014. Comisión de Investigación de Accidentes e Incidentes de Aviación Civil. Report A-032/2008, “Accident Involving a McDonnell Douglas DC-9-82 (MD-82) Aircraft, Registration EC-HFP, Operated by Spanair, at Madrid-Barajas Airport, on 20 August 2008.” Approved July 26, 2011. Seeing Machines announced in December that it had collaborated with L3 Commercial Aviation to incorporate eye-tracking technology into an L3 Boeing 787 full flight simulator for an Australian airline — a development that Seeing Machines said was the first time that permanent eye-tracking equipment had been incorporated into a full flight simulator for civil aviation pilot training. Similar eye-tracking technology also is in place or being developed for use in other sectors of the transportation industry, including commercial trucking and rail operations. In those cases, the technology can be used to monitor for distractions and to identify cases of operator fatigue, the company said. Early studies examined data collected during simulator flights by 40 pilots who were equipped with an eye-tracker system; the conclusion was that those pilots checked their flight instruments at varying frequencies and for varying lengths of time, but that more experienced pilots tended to focus for shorter periods of time on individual instruments. “At the time, researchers were confronted by the complexity of the recording setup and elaborate manual analysis procedures,” the report said, adding that the eye-tracking systems used in today’s research are easier to work with and that the technology has potential for use not only in simulators but also in flight. While acknowledging the difficulties of incorporating an on-board gaze recording device into cockpit recording systems, the report nevertheless suggested that, in the future, a cockpit voice recorder could be enhanced to serve as a “human data recorder” capable of recording gaze data. Such data could be used not only in accident and incident investigation but also during post-flight debriefings of the flight crew, the report said. HeliOffshore, a worldwide safety association for the offshore helicopter industry, and human factors specialist Jarvis Bagshaw have completed two phases of eye-tracking research designed to improve understanding of the pilot monitoring function and thereby aid helicopter flight crews in safer use of automation in their cockpits. 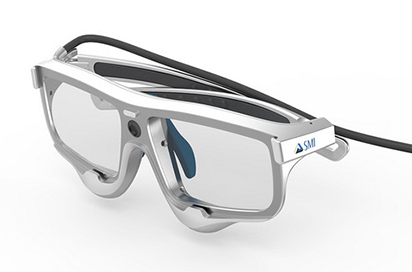 An example of eye-tracking glasses. The research involved 39 pilots from HeliOffshore member operators in an Airbus Helicopters EC225 simulator and a Bristow Group Sikorsky S92 simulator. 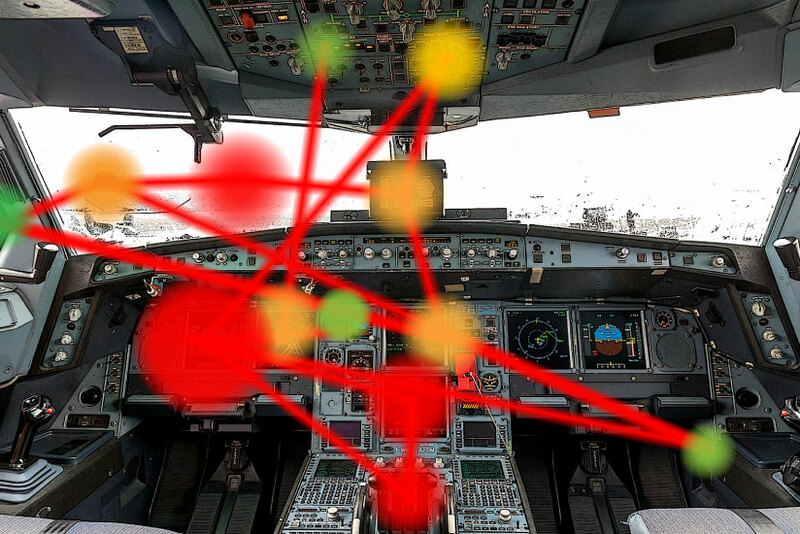 The pilots wore eye-tracking glasses that were connected to a combined camera and infrared light source that emitted bursts of infrared light (not harmful to the human eye). As the light bursts bounced off the eyes’ irises and corneas, the eyelids and the skin surrounding the eyes, those areas “reflected different levels of infrared light, which was picked up by the camera and then analysed to reveal which areas of the cockpit displays are monitored during which phases of flight,” HeliOffshore said. The results enabled researchers to determine “how crews observe flight instruments and other cockpit displays together and independently, as they perform prescribed and unprescribed procedures,” the organization said. “If used wisely, the eye-tracking technology can facilitate and accelerate pilot training, facilitate the investigation of in-flight incidents and considerably enhance flight safety,” the report said. Technological advances, and especially the increased reliance on automated systems, have played a primary role in achieving today’s relatively low accident rates — which were 20 to 30 times higher in the 1960s, the report said. At the same time, increased automation has made active monitoring of flight parameters into a critical skill. “Maintaining an excellent monitoring performance is not easy,” the report said, citing earlier research that concluded that, when pilots are not performing a specific, well-defined task, lapses in monitoring may occur. 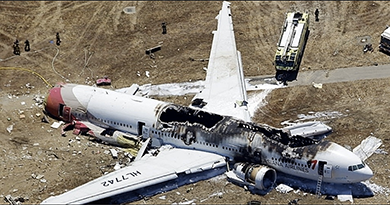 The report also cited a U.S. National Transportation Safety Board (NTSB) accident review that concluded that inadequate monitoring and cross-checking occurred during more than 80 percent of major flight-crew-involved accidents from 1978 through 1990. Peysakhovich, Vsevolod; Lefrançois, Olivier; Dehais, Frédéric; Causse, Michaël. “The Neuroergonomics of Aircraft Cockpits: The Four Stages of Eye-Tracking Integration to Enhance Flight Safety.” safety Volume 4 (Issue 1). Feb. 27, 2018. Reynal, M.; Colineaux, Y.; Vernay, A.; Dehais, F. “Pilot Flying vs. Pilot Monitoring During the Approach Phase: An Eye Tracking Study.” In Proceedings of the International Conference on Human-Computer Interaction in Aerospace. Paris, 2016. Cited by Peysakhovich et al. Lefrançois, O.; Matton, N.; Causse, M.; Gourinat, Y. “The Role of Pilots’ Monitoring Strategies in Flight Performance.” In Proceedings of the 32nd Conference of the European Association for Aviation Psychology. Cascais, Portugal, Sept. 26–30, 2016. Cited by Peysakhovich et al. Peysakhovich, V.; Vachon, F.; Vallières, R.B. ; Dehais, F.; Tremblay, S. “Pupil Dilation and Eye Movements Can Reveal Upcoming Choice in Dynamic Decision-Making.” In Proceedings of the Human Factors and Ergonomics Society Annual Meeting. October 2015. Zhou, H.; Itoh, M.; Inagaki, T. “Eye Movement-Based Inference of Truck Driver’s Intent of Changing Lanes.” Society of Instrument and Control Engineers Journal of Control, Measurement and System Integration Volume 2 Issue 5 (2009): 291–298. BEA. Serious Incident Report, “Momentary Loss of Control of the Flight Path During a Go-Around.” Nov. 16, 2011. HeliOffshore. “News: HeliOffshore Workshops Support Operators Preparing to Adopt the Safety Benefits of Evidence-Based Training.” Jan. 8, 2019. Li, W.-C.; Lin, J.; Braithwaite, G.; Greaves, M. “The Development of Eye Tracking in Aviation (ETA) Technique to Investigate Pilots’ Cognitive Processes of Attention and Decision Making.” In Proceedings of the 32nd Conference of the European Association for Aviation Psychology. Cascais, Portugal, Sept. 26–30, 2016.